In August 2013, my husband and I spent a weekend in Seattle for his birthday. We took two day trips outside of the city and spent the remaining time exploring Seattle. 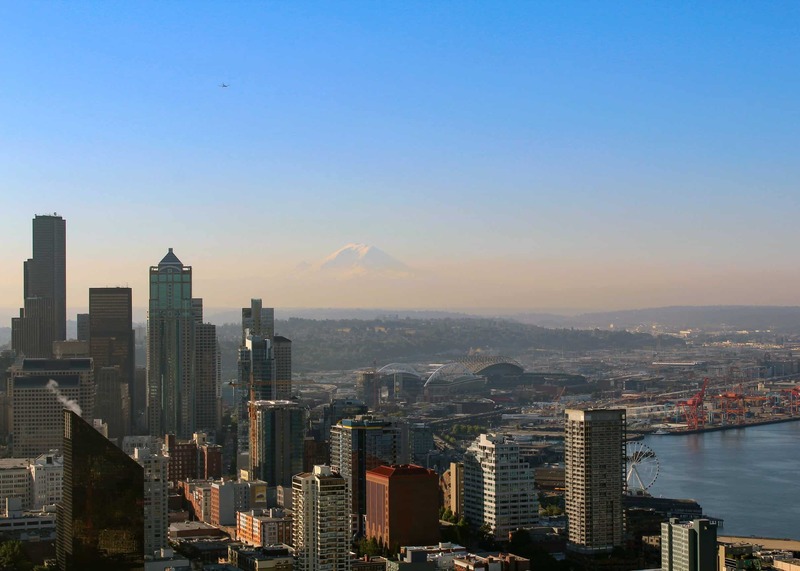 In addition to using this blog post for inspiration, as you start planning your trip to Puget Sound, check out Seattle’s tourist website. Here’s some of the 9 highlights from our short stay in Seattle. No trip to Seattle would be complete without a stroll through Pike Place Market. If you make itineraries for your travels, plan to go to the Market in the morning. For those early birds, bakeries open at 6 AM. If you want to watch any throwing fish or purchase seafood, you’ll want to arrive around 7 AM. To be first in line for fresh produce, you’ll want to arrive around 8 AM. Otherwise, the official opening time for the market is 9 AM. The market closes at 6 PM (earlier on Sundays). We unfortunately didn’t make our way to the market until the late afternoon, so there wasn’t a whole lot to see by then. The Market is located along the wharf (if you walk past the gum wall, you’ll end up at the Market). There is a plaza along the waterfront, behind the market, where you can hang out or eat your purchases. If you’re a coffee fanatic, Pike Place Market is where the original Starbucks is located. I love coffee, but I don’t necessarily love Starbucks coffee, so we just walked passed by to say we’ve seen the original. It wasn’t as crowded as I had expected, but there were enough people to dissuade me from going inside. The Lower Level of the market center is where you’ll find retail shopping. Under the Clock is a large piggy bank. You can rub its snout for good luck and make a donation to Pike Place’s social services. To help plan your visit, check out Pike Place’s Walking Guide 101. It may be a touristy spot, but it just didn’t feel right to go to Seattle and not make a stop at the famous Space Needle. Since we were staying on the south side of downtown, it was too far to walk over there, which gave us an excuse to use the light rail system, Light Link. Living in San Antonio, Texas, we don’t get to use public transportation very often. Whenever we’re in a city with decent buses or rail systems, we use it! There were two Light Link stations near our hotel: Pioneer Square and University Street (a few blocks away). For information about the Light Link, check out this website. The Light Link will not take you all the way to the Space Needle. We got off at 5th Ave & Pike (Westlake Station). Then we hopped onto the Monorail. The monorail has only two stations: Westlake and Seattle Center. We purchased round trip tickets (and luckily had enough cash on us–you purchase on board and it’s cash only). For other transportation options, check out this link. You get a free photo from your visit, too. My husband found it really cheesy but I loved it. You get a code (if I remember correctly) and you can download it online later that day. There is also a restaurant in the Space Needle (SkyCity) but we didn’t stay long enough to eat there. Click here for information about the restaurant (at the time of this post the restaurant was closed for renovations). The infamous Gum Wall. Personally, I found it disgusting, but we decided to pass by on our way to Pike Place and see what all the hub-bub was about. We didn’t have any gum on us so we couldn’t add to the wall. (Not that I would have anyways. I’m not germaphobic, but still, ew.) The wall belongs to the Market Theatre building. The section of the alley where the gum wall is located is just that, an alley. There’s not much else to see besides used gum on a wall. But if you keep walking towards Pike Place down Post Alley, you’ll find restaurants, cafes, and shopping. Location: Intersection of N Fremont Ave and 35th St N – is a good place to start your tour of this neighborhood – its where you’ll find the Center of the Universe Guidepost! You can get to Fremont pretty easily by taking the bus from downtown Seattle. You can easily spend half a day in Fremont. Here’s some of the highlights! I only had one thing on my list of things to see in Fremont, so I didn’t look up ahead of time what else there was to do in Fremont. All I wanted to do was see the Troll (which I has seen in the movie 10 Things I Hate About You). We had to wait our turn while a few other people took photos with the Troll (or while kids climbed all over it). But there weren’t too many people there, so we had the Troll to ourselves after a while. Down the street from the Troll, on the corner of 36th Street and Evanston Ave, is the famous statue of Lenin. Its the only known depiction of Lenin surrounded by guns and flames rather than books. It was the author, Emil Venkov’s, way of portraying Lenin as a violent revolutionary. During the 1989 Slovakia revolution, an American found it toppled. He brought it back to the states and, though his family owns it, the statue remains on display for the public. The coffee shop where we stopped after seeing the Troll doesn’t seem to exist anymore. But if you’re looking for some coffee, check out Fremont Coffee Company. It’s located a few blocks from the troll and nearby Theo Chocolate. Hours: Tours are by reservation – book ahead of time! If you’d like to book a tour, click here. We didn’t have time to tour Theo Chocolate but a friend of mine highly recommends it! We walked around the neighborhood, window shopping and admiring different art work, then went down to the river where we were greeted with hedges shaped like dinosaurs! The river was a great spot to sit and relax, rest our feet, and take in the beautiful day. We finished our time in Fremont at the Red Door for a late lunch. Had a nice meal, some beer, and enjoyed the beautiful warm weather on their patio facing the river. If you visit on a Sunday, head to 400 N 34th Street for Fremont’s Sunday Market. Its a large flea market with around 200 vendors. We passed by the Central Library when we were out walking around downtown. If we were in Seattle for a longer time, I probably would have convinced my husband to check out the inside. But, since we didn’t have the time, we made sure to pass by and admire the award-winning architecture. I wasn’t able to capture the entire building with my camera. I suggest walking past the library (if you can’t go inside) to marvel at the design. We spent one of our evenings at a Seattle Mariner’s game. The stadium is located down the road from China Town, so we grabbed an early dinner in China Town before the game. To get there from downtown, you can take the Light Link to King Street Station. Its about a 15 minute walk from the station to the stadium. After the game, we chose to walk back to our hotel. There was a good crowd of people who did the same. We passed through Pioneer Square on our way. If we didn’t have to wake up early the next day we probably would have stopped for a drink like many of the baseball fans. Pioneer Square is Seattle’s “original neighborhood” (established 1852). Before the baseball game, we stopped in Seattle’s Chinatown. Since all we did was eat at a small restaurant at the back of a tiny market, I can’t really describe what to do and see in the Chinatown-International District. Check out Seattle’s website for more information. Share in the comments your favorite spots in Chinatown! Click here for the location of Chinatown Gate. Spend a day on Mount Rainier! We took a day trip to the National Park and hiked a trail on Mount Rainier. To find out more about this hike and the National Park, check out my blog post, here! (9) Day Trip to Victoria, B.C. Only a ferry ride away, add a trip to another country to your itinerary! Check out my post on our day trip to Victoria, here! Where are you favorite spots in Seattle? Share in the Comments below!